Bob Menendez is a Democratic member of the United States Senate, representing New Jersey. Menendez was sworn in to the Senate on January 18, 2006, having been appointed by New Jersey Governor Jon Corzine to fill the remainder of his term. Later that year, New Jerseyans elected him to serve a full six-year term as United States Senator. He currently serves on the Senate Committees on Finance; Banking, Housing and Urban Affairs; and Foreign Relations. Bob is also the Chairman of the Banking Subcommittee on Housing, Transportation and Community Development; and the Foreign Relations Subcommittee on Western Hemisphere, Peace Corps, and Global Narcotics Affairs. Bob Menendez was born on New Year’s Day, 1954. He received his B.A. from St. Peter's College in Jersey City and his law degree from Rutgers University. He currently lives in Hoboken and has two children. Menendez has served as a school board member, a mayor and a state legislator. Since 1993, "he has been standing up for New Jersey families in Washington, where he rose to become the third-highest ranking Democrat in the U.S. House of Representatives." After September 11, 2001, "Bob earned national recognition for his leadership in reforming the country's intelligence, security, and public health systems and for fighting to establish an independent commission to investigate the terrorist attacks on our country". He was a leader in the fight to successfully implement the 9/11 Commission’s national security recommendations, including the provision to ensure that high-risk states like New Jersey receive their fair share of security funding. He helped author legislative language that will ensure all cargo coming to U.S. ports is scanned. He led the successful drive to fully reopen the Statue of Liberty, and today, he is working to improve the security of our bus, rail and public transit systems. In 2002, when allegations surfaced that the Irish Republican Army was working with Colombia's narco-terrorist FARC guerillas, the Irish Echo commented on many US Congressmembers' Sinn Fein sympathies. The 47-member House International Relations Committee represents a broad cross-section of congressional political opinion. Fourteen of the members represent northeast (mainly New York and New Jersey) constituencies, some such as Ben Gilman’s, with a strong Irish-American makeup. A substantial core of these have been identified over the years with Irish issues. As well as Gilman, they are Peter King, a New York Republican; Robert Menendez, a New Jersey Democrat; Joe Crowley, a New York Democrat; Christopher Smith, a New Jersey Republican; Eliot Engel, a New York Democrat, and Gary Ackerman, also a New York Democrat. All have been sympathetic to Sinn Fein and the Irish nationalist agenda in general. King has been a long-time supporter also of the IRA. Smith was prominent in the hearings into Northern Ireland police reform. They can be expected to lend a sympathetic ear to any plausible explanation from Sinn Fein as to what the three republicans were doing in Bogota, should the party chose to send a representative to the hearing. However, Rep. Hyde and Cass Ballenger a Republican from North Carolina, both conservatives, have been resolute in their determination to look at the allegations of IRA and FARC links. Ballenger was unequivocal when speaking before the Subcommittee on the Western Hemisphere on April 11. “The IRA has been in Colombia providing the FARC narco-terrorists with urban terrorist expertise and training,” he said. The Council for a Livable World, founded in 1962 by long-time socialist activist and alleged Soviet agent, Leo Szilard, is a non-profit advocacy organization that seeks to "reduce the danger of nuclear weapons and increase national security", primarily through supporting progressive, congressional candidates who support their policies. 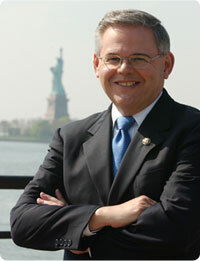 The Council supported Bob Menendez in his successful Senate run as candidate for New Jersey. Senator Bob Menendez received money from the Iranian American Political Action Committee during the 2012 election cycle. The Alliance for Retired Americans Political Action Fund endorsed Bob Menendez in 2012. In 2013 Bob Menendez was a member of the Congressional Hispanic Caucus. In 2013 Progressive Democrats of America assigned activists to deliver their material to almost every US Congressman and several Senators. Mary Ellen Marino, was assigned as contact for Sen. Menendez. December 4, 2013, saying their 22-day "fast for families" to demand Congress approve comprehensive immigration reform had gotten worldwide attention, former Service Employees Secretary-Treasurer Eliseo Medina and his fasting colleagues ended their D.C. vigil by handing off the fast to a group of successors. Numerous lawmakers stopped by the tent to express their support. Twenty six members of Congress, all Democrats, even joined the fast in solidarity for 24-hour periods, including Joe Garcia, New Jersey Sens. Bob Menendez and Cory Booker and California's Zoe Lofgren, the top Democrat on the House's immigration subcommittee. Jersey City, (February 18, 2017) – New Jersey City University (NJCU) will present “NJCU Students Supporting Refugees: Open Arms, Open Hearts, Open Doors” on Friday, February 24, 5:00 - 9:00 p.m., on the NJCU Main Campus at 2039 Kennedy Boulevard in Jersey City. The event will take place in Multipurpose Room B of the Michael B. Gilligan Student Union Building. All are welcome. The evening represents the culmination of many months of work to develop a Refugee Center at NJCU. The effort was spearheaded by the Muslim Student Association (MSA) and supported by MSA Faculty Advisor and Assistant Professor of Biology Meriem Bendaoud, and Professor of English Audrey Fisch. Dinner for the evening will be provided by GERA, Global Emergency Response and Assistance. This organization, along with Church World Services (CWS) and International Rescue Committee (IRC), provides key support to refugees arriving in the Jersey City area. Speakers on February 24 will include NJCU President Sue Henderson; Dinesh Suryawanshi on behalf of U.S. Senator Cory Booker; Esther Ongeri on behalf of U.S. Senator Robert Menendez; NJCU faculty member and Syrian Rescue Scholar Hassan Aljabbouli; NJCU student and Syrian refugee Zaki Minas; and Public Relations Representative from GERA, Jessica Abdelnabbi. Any questions about this event can be directed to Dr. Meriem Bendaoud, , Faculty Advisor, Muslim Student Association, or MSA President Rania Noubani. This page was last modified on 29 January 2018, at 18:46.